A pretty and popular high school girl dies in a car accident and gets to relive the day of her death over and over. 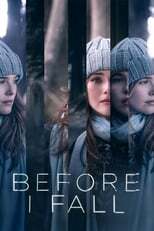 Before I Fall is directed by Ry Russo-Young and was released on Mar 3rd, 2017. Director Ry Russo-Young's Drama & Mystery movie Before I Fall is produced by Open Road Films & Jon Shestack Productions & was released 2017-03-02.